Bestselling and Thurber Prize–winning humorist David Rakoff was one of the most original, delightfully acerbic voices of his generation. Here, in one place, is the best of his previously uncollected material—most never before published in book form. 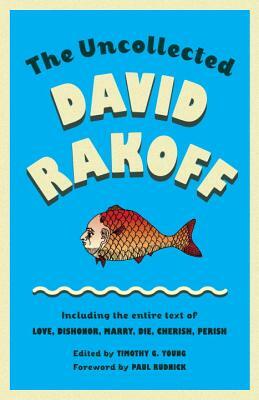 David Rakoff’s singular personality spills from every page of this witty and entertaining volume, which includes travel features, early fiction works, pop culture criticism, and transcripts of his most memorable appearances on public radio’s Fresh Air and This American Life. These writings chart his transformation from fish out of water, meekly arriving for college in 1982, to a proud New Yorker bluntly opining on how to walk properly in the city. They show his unparalleled ability to capture the pleasures of solitary pursuits like cooking and crafting, especially in times of trouble; as well as the ups and downs in the life-span of a friendship, whether it is a real relationship or an imaginary correspondence between Gregor Samsa and Dr. Seuss (co-authored with Jonathan Goldstein). Also included is his novel-in-verse Love, Dishonor, Marry, Die, Cherish, Perish. By turns hilarious, incisive and deeply moving, this collection highlights the many facets of Rakoff’s huge talent and shows the arc of his remarkable career. With a foreword by Paul Rudnick. David Rakoff is the author of four New York Times bestsellers: the essay collections Fraud, Don’t Get Too Comfortable, and Half Empty, and the novel in verse Love, Dishonor, Marry, Die, Cherish, Perish. A two-time recipient of the Lambda Literary Award and winner of the Thurber Prize for American Humor, he was a regular contributor to Public Radio International’s This American Life. His writing frequently appeared in The New York Times, Newsweek, Wired, Salon,GQ, Outside, Gourmet, Vogue, and Slate, among other publications. An accomplished stage and screen actor, playwright, and screenwriter, he adapted the screenplay for and starred in Joachim Back’s film The New Tenants, which won the 2010 Academy Award for Best Live Action Short. He died in 2012. --O, The Oprah Magazine, "10 Titles to Pick Up Now"